This article is about the modern settlement. For ancient archaeological site, see Mycenae. For other uses, see Mykines (disambiguation). 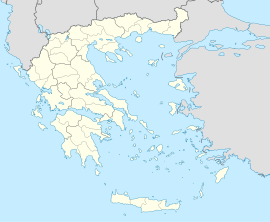 Mykines (Greek: Μυκήνες, before 1916: Χαρβάτι - Charvati) is a village and a former municipality in Argolis, Peloponnese, Greece. Since the 2011 local government reform it is part of the municipality Argos-Mykines, of which it is a municipal unit. The municipal unit has an area of 159.033 km2. It is located 1 km west of the ancient site of Mycenae and 2 km east of the highway linking Argos and Corinth. It is 9 km north of Argos. The village is near the archaeological site of Mycenae. This page was last edited on 11 March 2019, at 12:19 (UTC).